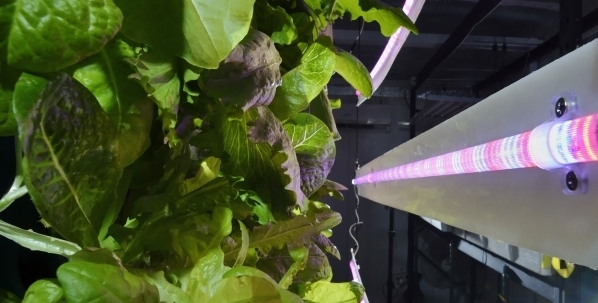 A revolution in farming technology is being piloted in the Las Vegas Valley. 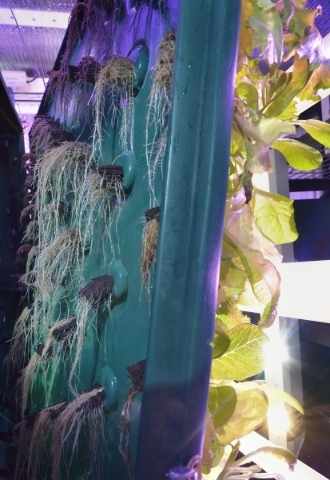 The owners of Las Vegas-based Indoor Farms of America LLC unveiled their “vertical aeroponic” growing system last week at their offices at 4020 W. Ali Baba Lane, Suite B, near Valley View Boulevard and Hacienda Avenue. Company officials estimate the technology could save 5 to 10 percent more water than hydroponics systems and a 95 percent estimated savings over traditional farming methods. But the crowning achievement, according to David Martin, CEO and co-founder of Indoor Farms, is the amount of plants per square foot a farmer could grow with the new system — 40 per square foot. The technology allows a farmer to grow up, going where traditional farming can’t. This high number of plants can be achieved with a vertical clearance of 8 feet. Farmers can grow several plants, including leafy greens such as mesclun mix, baby red romaine, Genovese basil, and arugula, cherry tomatoes, and Thai chili peppers, or fruit such as seascape strawberries. Some plants are still off-limits, such as potatoes and carrots. 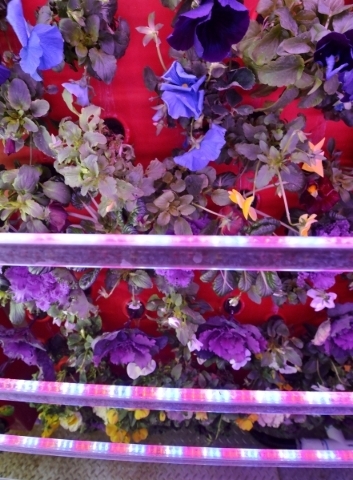 The plants can be seen hanging along the plastic-encased system, but there is more to the story if you open up the square-shaped, hollow design: spray nozzles shoot mist. The plants are also supplied with natural-organic fertilizer. 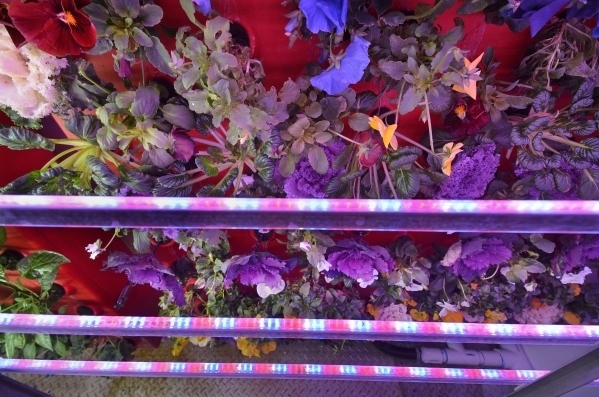 LED lights do the job that the sun usually takes care of, which leads to faster growing times than traditional farming techniques. Ron Evans, co-founder, and Martin had their system in development for nearly two years before launching. Patents are still pending on the equipment, Martin said. Those patents include one on a box near the back of the truck, but some important things go on inside of it. The water is controlled and fully circulates through the system. Inside the box are five layers of rocks and sea shells. When the water enters the box, minerals are naturally leaked into the water. The venture began with Evans and Martin planning on going into business to become aquaponics farmers, which Martin described as fish farming and hydroponic lettuce growing. Evans already had more than a decade of experience with aquaponics. But the return on investment didn’t seem to be high enough with the existing equipment. In the pursuit of a better growing apparatus, the idea of the new venture took life. 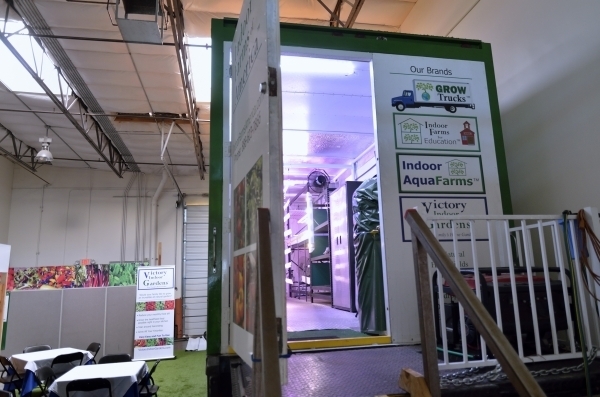 Indoor Farms has varying levels of design, such as a grow space in a semi-trailer, box truck or stand-alone container. It can also build a grow space inside an existing space such as a greenhouse, warehouse, outbuilding or shed. Indoor Farms can also tack onto an existing grow space already in operation. It offers do-it-yourself packages or it will install the equipment. Packages range from just over $6,000 to $120,000 for farmers that already have an existing system inside a greenhouse, warehouse or other building. 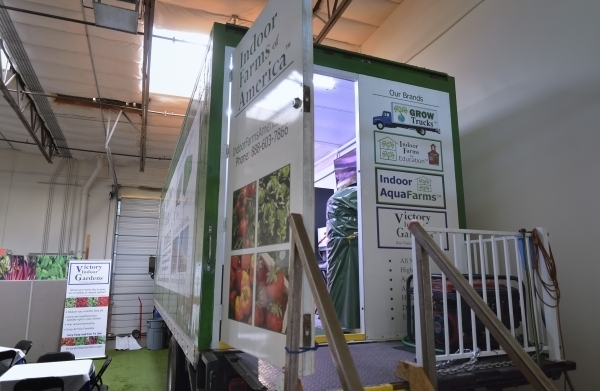 For farmers looking to start from scratch, Indoor Farms offers packages for containers and other various trailers ranging from $30,000 to nearly $80,000. None of the pricing includes the enclosure or the labor to install and other various structural items. Pricing on setting up a farm inside a structure such as a warehouse, greenhouse or other buildings can start under $5,000 and goes to over $200,000, depending on how large the farmer wants to go. 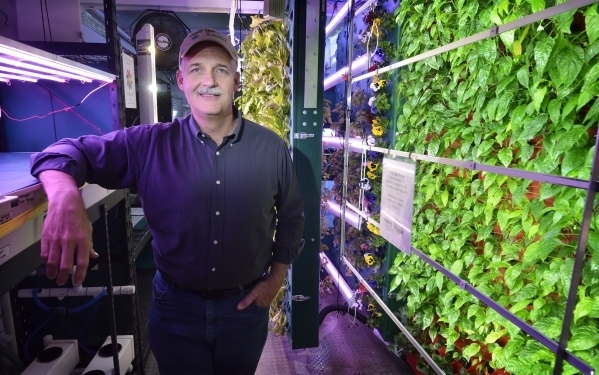 Martin said Indoor Farms has also been approached about the idea of living walls, something that was not part of the plan, but he is pursuing. The speed of growing is faster than traditional farming. Martin said traditional farming can take up to 65 days but some are down to 45. In his system, plants can grow to harvestable size in less than 30 days from transplant. The seeds are germinated inside the space where the growing takes place, 8,000 plants can be germinated in two weeks inside a shipping container space, Martin used as an example. Greg Boudreau, an investor from the Pacific Norhwest, is taking the plunge in the farming business. 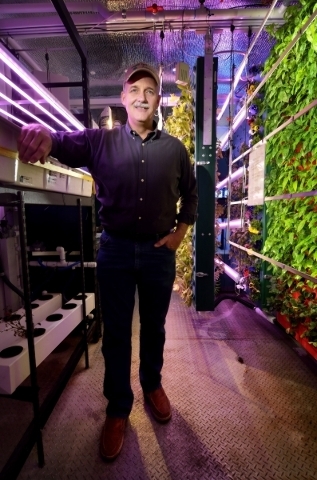 “The whole preference and focus of our business in using Indoor Farms is technology, which is really just new growing technology that allows to grow product more effectively in an arid climate like Las Vegas,” Boudreau said. The key is to bring food local and hopefully serve a need, he said. “I think restaurants in Las Vegas in general, want to see fresh produce on their table which they wouldn’t normally be able to get,” Boudreau said. That’s what Boudreau is hoping for — to bring fresh veggies to local restaurants. Boudreau has invested in agricultural-zoned land in the northwest valley and is planning on putting his first test containers out there to test productivity, quality and other things of that nature. “We should have product available to sell a few months after we get everything nailed down,” he said. Martin wants to bring farming to the city instead of the country. Martin is interested in going global, however. Another benefit is that farmers can grow in areas with little water. Martin gave the example of Africa, where water is scarce and residents have no electricity. “They can run a farm on only a few hundred gallons of potable water a month, and they can solar power the whole farm,” Martin said.